7 Quick Takes Friday: Need Kid Advice (and other stuff) | House Unseen. Life Unscripted. I was going to talk about towels. Specifically, how not to fold them and WHY, for the love of sweet baby Jesus in His flaxen diaper, it is so important for you to learn such before you receive your official grown-up certificate, but my husband is not home to fold a towel in the improper manner so that I may photograph it for the DO NOT picture. So you'll just have to wait. No, he has not received his official grown-up certificate yet. Poor guy. Instead, let's talk about gifts for the ungiftable. Our eldest is turning ELEVEN at the end of the month (so weird since I'm pretty sure I'm 24 or something) and I am stumped on a decent, affordable, memorable gift for her. She's a bookworm tomboy. She couldn't care less about clothes or electronics or pop stars. She likes to write. Help! Speaking of writing, there is some awesome writing in the Catholic world, for today and for all time. But today I'm talking about today. Specifically...look what finally came in the mail! pose inspired by editor Hallie Lord . Editor! So fancy! Yay! 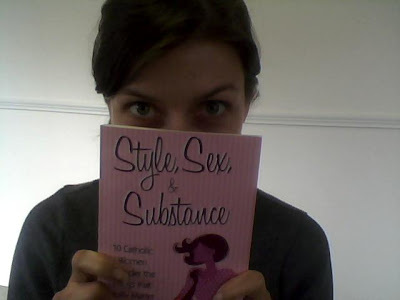 Surely I am the very last Catholic woman to get her hot little hands on this gem of a book, though. Late to the party as usual. Speaking of which (the late arrival to the party and all that), nope, have not watched a single episode of Downtown Abbey. Haven't read Hunger Games. Haven't purchased an e-reader. Don't know what quinoa tastes like. Don't have an iphone. Or ipad. There. I said it. Whew! Now I feel better. You know what else makes me feel better? Purging! 40 Bags in 40 Days time! Most of the kids are gone today and the small one is down for her nap. So do you know what I've done? Raided the playroom. Oh yes I have. Because as much as I want them to learn about giving up their things on their own, I don't wanna actually, you know, fight with the boy whilst he wails on the floor and throws ashes on himself because of that particular Tonka toy. The costume bins last week were drama enough, thankyouverymuch. So there it is- 6 more bags for 6 more days of Lent. Note how they're hidden on the other side of my bed. I'm such a coward! For anyone who congratulated me here or on the facebook page regarding yesterday's post or who commented at Catholic Exchange, THANK YOU. Thank you for your love and kindness and support and for putting up with all my run on/fragment sentences. Seriously, do I ever use proper sentence structure on this here blog? Rarely. Now if you'll please join me in praying for the Holy Spirit to move me in some meaningful direction before this time tomorrow, I would heart that. Because, you know, what do I know? Just a gal wearing an oversized Limoncello apron. Totally unrelated: If you have a son, or sons, when were they able to dress themselves? Dude, the boy will be FIVE years old in August, and still gives me a hard time about getting dressed. Cecilia, who is not yet TWO, will surely surpass him in the self-clothing department any day now. I gotta get him dressing himself before the new one arrives in June because, um, hello? And I actually don't have anything to say after that except that it would be pretty convenient for me. And clearly I'm a whiny pants. Oh, also, since you mentioned clothing and Cecilia-who-is-not-2: she will be 2 at the end of this month. And she is obsessed with the idea of going to the potty. Obsessed! Tells me when she's wet or dirty, asks to sit on the baby potty, tags along when anyone needs to go on the big potty. So (deep breath) I'm thinking it's about time to buy her some big girl undies and see how it goes. And then I will cry...CRY...because she's just gotten too big too fast. *sniff, sniff* Waaaaaaaah! She writes the story, she illustrates the story, you send it off and it gets professionally typeset and hardbound. William just turned 4 in February and he dresses himself. He occasionally needs help with zippers and such but he does most of it on his own. good grief, my husband canoot fold a dang towel to save his life, no matter how many times i show him!!! what is the deal with this testosterone fueled mental block to proper towel folding? ugh. congrats on #5! that's awesome!! #7, yes, embrace that willingness! Book/movie combo of Hugo for your daughter's bday? I watched it yesterday and totally loved it and would have loved is as the 11 year old tomboy i was. I hear the book is fab. As for folding towels. I have given up. I used to have that fight all the time. Just recently I have found an alternative. Rolling them. Now everyone can roll them right. No screaming mama. March must be the month for birthdays. My oldest will be turning 14 on the 10th. But what to get your bookworm tomboy. As my middle child would say, duh Captain Obvious, Books. Try the thrift stores or second hand book stores. But how about The Daring Book for Girls. Such a great one for a reading tomboy. I got it for my soon to be 14 year old one year. For your young writer: hardbound blank books. Maybe a book ABOUT writing for budding writers, with story prompts or something similar? How about a used typewriter if she doesn't care for computers? If I could find an old typewriter that works, that would be fun for ALL of us! #4 - Good job on all the purging! Well, I just bought my oldest (17!!!!!!!) the Lord of the Rings Trilogy - I was thrilled that she is still reading real books instead of horrid teen lit. And is it bizarro that when I pass my 'Goodwill pile' by the front door, I think of you, and 40 days??? i am your newest follower...pls follow back if you can. I had never heard of that book until this morning so I am putting on my KINDLE...yes, an e-reader! It's the only fancy electronic thing we have, our phones still flip open and whatnot, but I love its fanciness. And don't worry... I don't have an iphone, or an ipad. I've barely even heard of Downtown Abbey. What is quinoa? Also, I have an e-reader, that I won selling Scentsy, and I read the Hunger Games because I got them for my sister, then read them when she was done. haha. Every 11-year-old bookish girl needs a beautiful journal. And her very crafty, very clever mother could find a cheap hardbound journal that's plain-ish and then make a beautiful cover for it, perhaps? My five year old boy just got the hang of reliably dressing himself this year, so... either your boy is not too far behind or we're both bad at this. I had to force myself to stop getting impatient and helping him for him to realize he had to do it himself, because when he first started dressing himself he was v e r y s l o w.
I need to de-clutter so badly... but I don't have time to do it every day right now! Oh my, 2 birthdays coming up! I second all the journal ideas above because I have no original ideas of my own. Also, happy potty training - sounds like it'd be an easy one (but yes, they grow so fast, but hey, another baby on the way, win!). I love you little girl's cheeks, so adorable. I cannot even imagine my younger one potty training, so I won't. 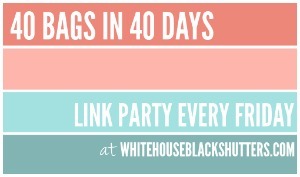 And I love the 40 bags in 40 days thing, can I do all 40 right at the end? Syke, I may try to get this started. Maybe a pretty journal for your daughter? Or a set of some classic books? You're only the second to last one to get her hands on that book- I'm still without one! Seriously with the boys and dressing! Search on Etsy for fabric covered notebook. I picked up one along with a couple of nice pens for the handy holder in the inside pocket for my 12yo daughter and she was tickled! I just wanted to toss in here that I've decided to let it go when it comes to my hubs and towel folding. Why? Because he's actually folding laundry. It's like.... The heavens have opened and the Heavenly Host is singing just for his weak fold-the-towels-in-sloppy-quarters talent. And I'm grateful that he even bothered. Sorry, my brain is in pudding mode. I agree with the journal ideas! There is nothing more exciting for a budding writer than to get fresh paper and special pens. Along those lines, if you haven't introduced her to the Betsy, Tacy, and Tib series I highly recommend it! My 2 year old is mostly potty trained but he goes through phases. We'll have a few weeks on and maybe a week where he seems to have forgotten what a toilet is. The punk, lol. And all three of my boys can dress themselves, but to varying degrees. The five year old can do it all until he gets to tying his shoes. The three year old recently figured out how to turn his clothes right side out but for the life of me cannot EVER seem to put them on facing forward. Shirt & pants backwards, socks upside down (sole on top), and shoes on the wrong feet. At least his underwear is right. The two year old needs minimal help. The16 year old would tell you I have no idea how to dress myself. Has your daughter read any books by Madeleine L'Engle? The Wrinkle in Time series is wonderful! You are not alone on #3, I too do not own or have tried any of those things... heck, I havent even HEARD OF much less READ the book you were talking about either.... head in sand for sure. As for a gift idea.... is there a local community college that is offering writing workshops- you can gift her a class and its truly a gift that keeps on giving! ORRRRR..... you can start her her OWN BLOG!!!! free and easy! Good luck! Gotta say Dweej - let the towel thing go. You are about to give birth to yet another small, needy child. Any folding that YOU don't have to do is good folding! When my husband and I got married, we each had our own folding style. The first time we were folding together, I was all ready to "correct" his folding when I stopped and thought "Hey, he's folding. The towels are squares the way I like, but they ARE folded. Do I really want to mess up a good thing by telling him he doesn't fold right, and perhaps have less help? I think not!" So I didn't. I was wise, even at 24! It's really my kids who need to learn to fold the towels. They do their own clothes, but the older ones are getting big enough to start taking on some other responsibilities....and the towels are on the list! If she likes writing, maybe a very nice journal and pen set? But pens in different colors like green, blue, pink, red, glitter? I admire anyone who can get rid of 40 bags of stuff, much less in 40 days! Good job! Giift idea...get her a fancy schmancy journal or notebook, a nice pen (maybe one of those ones that has a special tip or removable tips...can't think of what they are called) and what if you found a book about writing or signed her up for a writing workshop for kids? Or hey. Take her horse riding. My tomgirl is horse crazy (she gets it honest) and it can't go wrong. At least in my world. The purging scares me. Or inspires me. Or I need more coffee. We do have some nice horse farms just down the road from us. And neighbors with horses, too! That might be a good family activity for the birthday weekend. Thanks! #3 is all me--except for the iPhone. My five year old phone was dying last fall, and when Brad went in to re-up our plan, he got the iPhone for free. So I caved. PS--My car is a 2003 model, so that makes up for the iPhone, no? My middle son will be 6 on Monday and dressing is still a ridiculous ordeal. He wrecks shoes rather than undo the VELCRO and putting them on properly. He is a putzer to te extreme. His 19 mo old brother will carry the shoes to their proper place by the door and puts on hats and will likely pass him in self-dressing by his 2nd birthday. Oh my gosh, so glad mine is not the only one. I KNOW he can do it. But he just...wow. He just takes so loooooooong and complains so muuuuuuuuuuuch and it's enough to make a woman cuh-razy! Wow I was feeling all bad cause I didn't read the Hunger Games and don't have a tv to to watch Downtown Abbey (whatever that is). But, I now feel totally trendy eating quinoa. My brother is still a baby (but already HATES being dressed and undressed) but my little sister is five (she'll be six in October) and last I heard getting her dressed was still like wrestling a hyperactive bear cub. She knows how to do it, as evidenced by the fact that if you send her to her room for a time-out she'll come out in a completely different outfit (and all her clothes will be out of the dresser and strewn across the floor), but if you tell her to go put on clothes in the morning? HAHAHAHA. Although I have a preferred way to fold my towels, if I'm lucky enough to get someone else to do it, I don't say a dang thing about they way they did it. Likewise for any other chore someone OTHER THAN ME does. I'm just grateful that someone else is doing something for a change. LOL! Keep the great posts coming! I'm really enjoying reading them. You are so stinkin' cute! A Real Baby! Who Wears Real Clothes! 10 (11?) Questions Answered. You're Welcome. 7 Quick Takes Friday: Dance! Scream!